These photos were taken at the 6th Annual Local Craft Beer Fest which was held at the El Segundo Rock & Brews on Sunday afternoon. Admission to the family and pet friendly event included 10 beer tickets, with a choice of 12 local breweries; as well as a barbecued tri-tip lunch. As far as the breweries pouring at the event, there was the cast of usual attendees like El Segundo Brewing, Strand Brewing, King Harbor Brewing, Ohana Brewing, Barley Forge Brewing and Three Weavers. Relative newcomers like Iron Triangle, Indie Brewing, Reel Brewery and Solarc Brewing welcomed the new kids on the block, Rob Rubens Distilling & Brewing and Two Coast Brewing Company. These photos were taken at the inaugural Long Beach Craft Beer Festival which was held Saturday afternoon and put on by the Forty-Niner Shops at California State University Long Beach (CSULB). Proceeds from the event went to help support student education through the growth and development of the Hospitality Management program at CSULB. When I first started thinking about what I would write about this event, I was going to say that for an inaugural event it was very well run; but the fact of the matter is that would not really be a fair assessment. This may have been their inaugural event but you would not know it if you had not been told beforehand. Someone had done their homework; it was run like they had been putting on craft beer festivals for years. The photos were taken Sunday at the Manhattan Beach Badminton Club where they held their inaugural Pub at the Club Craft Beer and Food Festival to benefit the Manhattan Beach Badminton Club’s Junior Foundation programs for special needs, Para and junior athletes. 100% of the ticket sales were donated to their Junior Foundation Programs; a charity dedicated to developing champions on and off the court by supporting all athletes, including special need and Para-athletes. These photos were taken Sunday afternoon at the El Segundo Rock & Brews Garden on Main 5th Annual Local Craft Beer Fest. The family and pet friendly event featured beers by 16 breweries, from Valencia to Redlands and all over the South Bay area. Included in the price of admission, attendees were treated to a nice barbecue, a raffle, face painting, and games for people of all ages. These photos are of the 2015 Taste of Brews Long Beach which was held Saturday afternoon at Lighthouse Park in Long Beach. The event featured dozens of craft breweries, food trucks, live music, games and great weather. 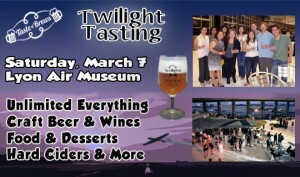 A portion of the proceeds from this event were donated to the Long Beach Marine Institute. As you know, I attend a lot of beer festivals; and there is no question that some are a lot better than others. For me personally, I like to find the breweries and beers that I have never had before. With the number of beer festivals that are held around here every year, I have come to accept that this goal is going to be more difficult with each successive beer festival I attend. The thing about Taste of Brews Long Beach is that they could have the same beer every year and I would return just because it is a great venue to hold a festival. While Lyon Air Museum was billed as a World War II museum, the first vehicle we were greeted by was a 1922 Ford Model T Roadster and it just got better from there. A beautiful 1931 Buick and the 1930 Cadillac V-16 Roadster were among my favorite cars; but there were military vehicles of all types and beautiful motorcycles. When you added in the aircraft it was pretty difficult to concentrate on the beer. But to be honest, I am not sure that craft beer was the number one thought of the attendees at this fundraiser for the Make-A-Wish Orange County/Inland Empire, The Little Red Dog out of Tustin and Ocean Education Outreach out of Newport Beach. I think it was one of those fundraisers that was priced so that it was more about the charity than the buzz. I don’t know, it just seemed a little classier than the standard local beer festival. 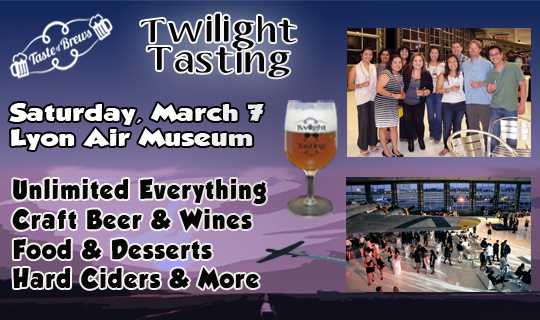 This coming Saturday, March 7, Taste of Brews will host their Second Annual Twilight Tasting at Lyon Air Museum in Santa Ana, California. This Taste of Brews’ upscale event promises to be a remarkable evening featuring unlimited tastes of premium craft beers, hard ciders, wines and tasty foods with all proceeds benefiting various charities. Designed by Synergy DTI Inc.